We were all nervous and scared of what our opponent would do today. After all it is a competition. We were all ready to compete. Our first selection was on rope 17, a light overhang. We watched the demonstrations. Everybody was very concentrated. I read with Marjolein. I had to climb as the 7th person. I was on time but I forgot to put on my number. Héllo had topped her first selection and by doing so she gave a second demo, perfect for the rest of us. Before it was my turn, I had to prepare myself. At the end of the route my legs began to shake. I said “sssshhhttt” to my legs and it was okay. I took the last hold and had an applause. I was the second person to top the selection. Laure-Anne had made an enormous fall. She had bumped her head into the wall, in her first route. 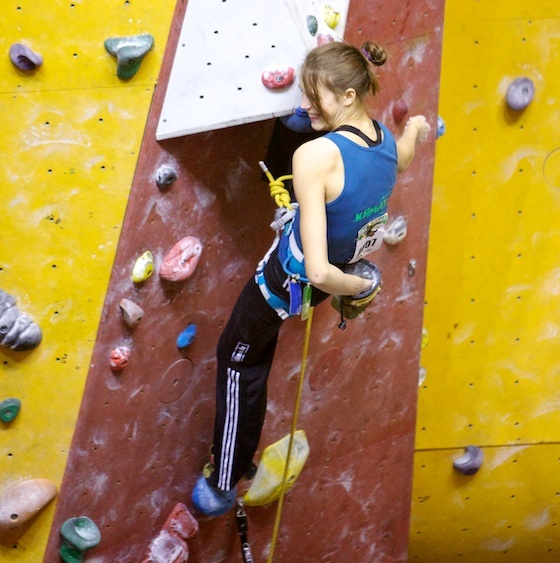 Cathinka climbed her route until the last move. Together with Elfe, Cathinka en Laure-Anne, I read their second route, which was my first route. I explained them every single move. The demo of our second selection was given 5 minutes after the demo of our first selection. Our route was a black one in the overhang. YES, IN THE OVERHANG! The first time I’m given a route on Open Vlaams in the overhang. The route was climbed by the A male group as well. There were not so many tops. Héllo almost reached the top, but fell at the last quick-draw. I was so pumped when I arrived at the last quick-draw, but I could hold on. I really had to pull myself up. I topped the black route in the overhang. We went to the isolation zone. We were all nervous. They checked if everybody was there. We climbed a little to loosen up our muscles. We were ready to do everything to top our route. The finals started. We could hear everything. We tried not to concentrate on what was happening outside the isolation. It was rather stressful. When I could finally walk out and start, I knew that Héllo had gone to the last hold, but I did not know that she had topped. I found a no-hands, I had put my knee underneath a big hold on a triangular volume and could release my hands. I was happy. I am always happy when I find a knee bar, if I fall afterwards I am still happy, not so happy but still happy, because people have seen my no-hands and they know that I am good at finding them. They know that I am there to give them my no-hands version. That is more important than really winning. If I win because of that no-hands, it would be worthy more than just winning. The pleasure of the competition is also important and that makes it a good competition. 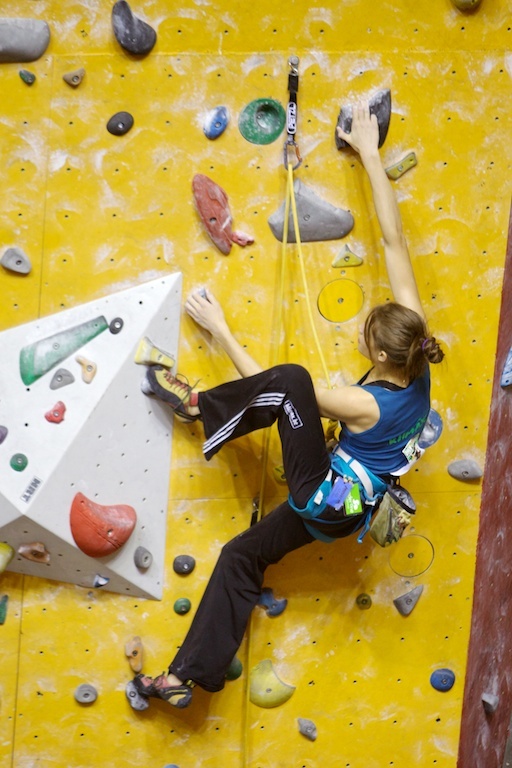 It isn’t only about winning, but also about whether the routes are nice and the things people can do differently in a route, the moves you can find. Being able to do your own thing and to show the people what you can do makes the competition interesting for the climbers and the others. I like it when people know me from something or somewhere. I don’t want to go somewhere as a stranger. The last hold was a tricky one. I had to take it with both hands and clip in. I didn’t do that. I fell. We were all happy with our prizes. 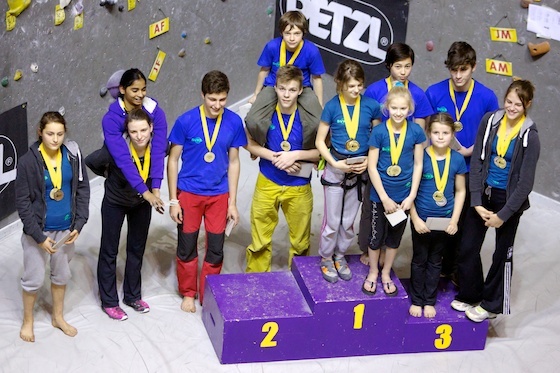 Klimax won the team ranking with more than 500 points. It was great. Everybody had done their best and as a team we grabbed quite some podium places. And to finish it off in style, for the first time in the OVJK history, all Flemish champions came from Klimax. We couldn’t be happier.